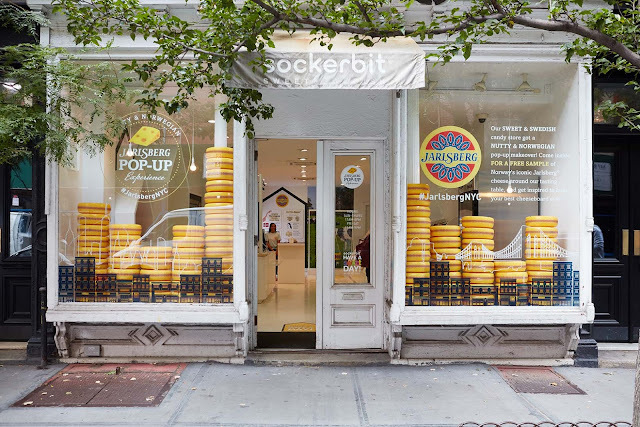 Home / Cheese / Food / Foodie / Jarlsberg / NYC Event / Pop Up Shop / Jarlsberg NYC Pop Up Shop - Now Open! Calling all foodies, you have from now until October 7th to enjoy samples of Jarlsberg cheese. Jarlsberg has opened up a Pop Up shop located here in Sockerbit, NYC. You won't want to miss out on this fun pop up shop. Fun way to spend a day in the city, eating cheese and getting to take lots of photos in their fun intereactive areas, which by the way have printers so you can get your pictures printed there to take home with you. But wait, that's not all. When you buy cheese at the pop-up, you get to bring home a Boska mini cheese planer as a free gift to you. If you are looking for something to do this weekend, make sure to stop by the Jarlsberg Pop Up Shop. There will be a special event, featuring Marissa Mullen, brooklyn food blogger and stylist – styled for fun occasions including “That Brunch Vibes Only Plate,” “That Just for Bae Plate,” “That Friendsgiving Plate,” and more. You will get to watch Marissa build two delicious food plates and sample them. You will also get to meet Celeb Chef George Duran who will share cheese pairings and be available to discuss the flavor, provide recipes and insight into the rich Norwegian History of Jarlsberg® Cheese. P.S. If you post on social media using #JarlsbergNYC you get a "Sweet & Swedish" treat, so share away! We will be there this weekend, follow us on Instagram @runchiquitarun to join in on the fun!